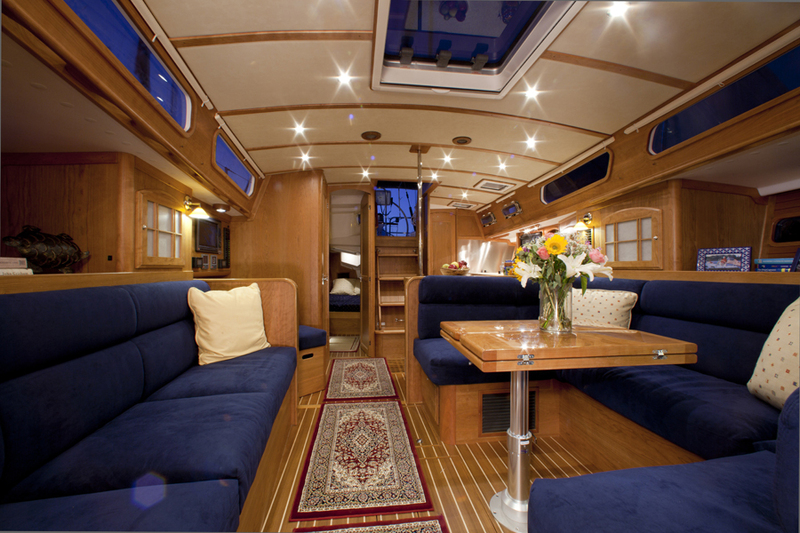 Westwind offers full service yacht detailing for boat owners in the San Francisco Bay Area. We provide one-time services as well as regular programs custom tailored to our customer’s individual needs and budget. Detailing a boat involves much more than applying and removing wax. Before a tool is even plugged in, Westwind can spend up to half a day preparing a boat for waxing. All compartments are opened and cleaned. Any stains, mold and scuffs are removed from the non-skid in an environmentally friendly “Green” way. Teak decks are cleaned gently and as needed. Canvas are cleaned and removed to avoid any over spray staining. Most boat owners never notice all the little things that are involved in a professional detail, which is why most detailers skip them. After the boat is prepared, the detailing services can include high speed machine orbital, and hand applied compounds, polishes, sealants, glazes, acrylics and a variety of waxes. Though a thorough preparation is very important to the final result, the most important part of detailing a boat is the initial evaluation of the fiberglass condition. Adding unnecessary steps can cause unneeded wear on the gel coat or paint as well as the wallet. With over three decades of hands on experience, Westwind has developed approaches that are not common in the boat detailing industry. Westwind was the first detailing company to vary the amount of abrasive if your boat needs compounding. We almost never use straight rubbing compound. While it may be a bit more time consuming, and more steps may be necessary, this ensures your yacht will have the gentlest approach to removing oxidation. Since the gel coat on fiberglass as well as paint varies by manufacturer and wears with age, which types of sealants and/or waxes will also vary. We will evaluate and discuss each option in detail with each boat owner to inform and ensure that the finest final finish can be obtained. While we use a high speed orbital buffer, we are one of the only companies that uses a variable high speed “random orbital” polisher on the final finish to ensure the highest gloss possible without the common swirl marks. But after waxing, we’re not done. Seats, fenders, lifelines, and all plastic or vinyl trim pieces are cleaned and treated. Isenglass, Strataglass and Raiinier windows are some of the most sensitive areas of boats. The proper knowledge of the diferences between clear vinyl, acrylic and polycarbonate, with the proper products and even the proper towels used can ensure that the view you have will be clear as well as protected. As a boat owner, one of the simplest yet most satisfying aspects of boating is to show up to a clean boat. You show up, stow your gear, start the engine, and leave. You can spend your day sailing/motoring with friends and family. You don’t have to get to the boat hours early to clean up weeks of dirt, salt and grime. When your day is done, a quick rinse of the salt on the hull (or not), and you just walk away. While most everyone can wash a boat, it’s your time that is important. Westwind can make a day with your family, actually a day with your family. Westwind has weekly, biweekly, monthly as well as on-call programs. A regular service includes washing the entire exterior surfaces (of course if the boat has enclosed areas they are cleaned as well). The first thing we do is remove any scuffs on the hull from docking, as well as re applying wax to that area. After rinsing the boat, we use a soft bristled brush on all the smooth gel coat and canvas to remove any dirt, salt and grime. We use a stiff bristled brush on the decks (unless teak) to keep mold and scuff free. We dry all the stainless, finished wood, windows, as well as gutters/gunnells where the boat does not drain. We are always sure to tidy all lines and ropes as well as a quick wash to your dock box to maintain a proper yachting appearance. In addition to the cleaning of the boat, a thorough inspection of the overall condition of the boat is noted and turned in daily by the crews of washers to provide proper oversight and evaluation for both the boat owner as well as Westwind management. Based on the issue, we will either address the need immediately, or you will be notified. Some common issues include frayed dock lines, deflated fenders, unplugged shore power, unraveling jib sheets, and unsnapped canvas covers. While a regular wash program is very thorough, we also can provide a personally tailored premium service that will surpass all expectations. Some examples include drying the entire boat as well as drying and treating the Eisenglass and Strataglass, preparing the boat for use by removing/replacing canvas covers and window coverings, or opening/closing any windows or portholes per your request. We can even launch or replace dinghies for your convenience. Westwind has custom tailored interior maintenance programs as well as one-time services. Whether you need a quick dust, vacuum, and wipe down of the heads and galley; or a thorough wipe of all services, dishes washed, beds made, laundry done, metal polished, wood maintained with oil, polish or varnish, carpets shampooed; or anything in between, Westwind can tailor a interior service to fit your needs. We can set up services weekly, monthly or yearly based on your needs. We specialize in preparing boats for sale as well as an initial clean up for new boat owners. Give us your wish list and we'll take care of it. Westwind has a full service wood maintenance and refinishing division. Our woodworkers are the best in the Bay Area at preserving and restoring private yachts. Wood that is properly cared for will not only look great but add to your investment. If your boat just needs maintenance coats or if you need a complete refinish, Westwind offers unbeatable craftsmanship. We work with each boat owner to determine a budget as well as a level of service needed. Some customers want to save as much existing varnish and touch up the damaged areas, while others prefer to take the wood completely to bare. We are happy to discuss all options and pricing to fit everyone's needs. Teak is a unique wood that is used extensively in the boat building industry because of its natural oils which inhibit woods tendency to rot and mildew. Westwind can maintain your teak with varnishes and or oils, as well as some newer translucent finishes (Cetol) and 2 part marine finishes (Awl grip). All the while, sealing the wood with a flexible, breathable finish that looks great. With regular maintenance, your finish will last for years to enjoy. Westwind also specializes in working with other woods such as mahogany, ash and holly. Each type of wood has its own special advantages and disadvantages, and require different approaches that many in the industry are simply unaware. We can also maintain your "teak" or "synthetic" decks. From periodic cleaning to complete re-caulking, bung replacement and sealing, Westwind can keep the decks on your boat in beautiful condition year round. Westwind has partnered with the manufacturers of the new synthetic decks and has all the necessary tools, equipment and knowledge to maintain their look and beauty. As a yacht management company familiar with the industry, we are also happy to provide boat owners with experienced direction to reputable vendors as well as full project management of these additional service companies. These include but are not limited to: canvas repair and replacement, haul outs, divers for bottom cleaning and zinc replacement, engine tune up and repair, electronics repair and installation, systems repair and installation, as well as fiberglass and gel coat repair or painting. Being in the boating industry for over 30 year, we know all the reputable companies in the Bay Area, and we also know the ones that are not. We can help you avoid waisted time and money trying to determine which are the best companies to have work on your boat.